A mobile crane is a type of crane that can be driven down the highway. If you go to a job site and see a bunch of cranes, you might think that they're all the same, but chances are most of the ones you see aren't the type of crane that you can drive down a highway. Instead, these "other" cranes are hauled to the job site on tractor-trailers and put together (often by mobile cranes). How many different types of mobile cranes does AME have? 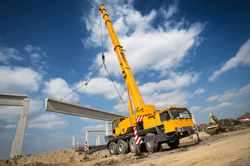 We have boom truck cranes, truck-mounted cranes, and all-terrain cranes. Tell us more about boom truck cranes. A boom truck crane is smaller. Most of the time, a boom truck is used for smaller type jobs, such as setting air conditioners on a smaller building and setting roof trusses on houses (not condos). Basically, when it comes to cranes, it's all about weight and reach. If we need to set a heavy thing farther away, we're probably not going to use a boom truck. For example, if we're working at a big factory and we need to place a 13,000-pound unit way across the roof, the weight is heavier and the reach is farther than if we have to place an 800-pound unit on a little strip mall. We'd use a boom truck for the strip mall, but not for the big factory. Let's talk about truck-mounted cranes and all-terrain cranes. They're bigger than a boom truck and so the variety of work they're able to do is larger. Let's go back to our example about setting a rooftop unit on a building. We'd use a boom truck for setting the unit on a small strip mall or, say, a McDonald's. But we'd use a truck-mounted or all-terrain crane to set a unit on a real three-story model or four-story model, a big factory, or a high-rise downtown. Think higher reach, further reach, and heavier reach. The bigger the crane, the more capacity it has to pick up heavy things and place them far away. What's the difference between truck-mounted cranes and all-terrain cranes? Size. An all-terrain crane is about as big as a crane can go and still travel down the highway. Boom trucks: 28 ton through 38 ton. What goes into choosing the right mobile crane? A lot of physics and discussions around safety. Our crane load charts serve as a guide. We also conduct site visits to make sure we have a thorough understanding of what we're dealing with. Are you looking for crane rental and operator services? Request a site visit today.